Tony Abbott has a new TV ad which, among other things, calls for 'real action to stop illegal immigration'. The graphic behind him shows a map of Australia surrounded by red arrows from the northwest labelled Iraq, Iran, Afghanistan and Sri Lanka. Curiously, one arrow is labelled 'Indonesia', despite the fact that Indonesians are not significant in the number of asylum seekers arriving by boat. The arrows remind me of the old 'reds under the beds' hysteria of the 1950s and '60s. Abbot says the key elements of the Coalition's border protection program include a return to a temporary visa for 'illegal boat arrivals who are found to be refugees', and a return to offshore processing. He also proposed as a last resort to turn around boats 'with no right to be in Australian waters'. None of these arrivals is 'illegal': the term does not exist in migration law. Neither is it an offence to enter Australia without a visa. Australia has agreed to process the claims of asylum seekers and test whether they meet the refugee criteria. If they do, then Australia is obliged not to send them back to where they fear harm. Resettlement is provided for the refugees and their immediate family members. Abbott's use of the phrase 'jumping the queue' is equally spurious. There are an estimated 15 million refugees worldwide, of which Australia resettles just 6000 from UNHCR annually. There are no queues. The processing of refugee cases is complex, and to liken it waiting in a bus queue is ridiculous. In July 2008, Minister for Immigration Chris Evans announced long overdue reforms of detention practices. These included a list of seven key immigration values. It maintained mandatory detention of unauthorised arrivals but stated that detention would be reviewed regularly and should be a last resort. The Government did abolish harsher aspects such as the Temporary Protection Visas, the 45-day rule limiting the right to work, and detention debts. They also put a stop to detention in Nauru and Manus Island. Other reforms were promised such as a form of complementary protection for cases that fall within human rights law but outside the refugee convention. Now, with an election on the way, the reform agenda has been put aside. Both the Government and Opposition are hardening their policies on asylum seekers. Sadly the debate is about who is the strongest on border control — the human rights of asylum seekers is not considered. Recently Prime Minister Rudd froze processing of cases for new arrivals from Afghanistan and Sri Lanka for six and three months respectively. This is despite the ongoing problems in both countries which cause people to flee. Waiting for these countries to improve enough to respect human rights, when both have been torn by conflict for over 30 years, will take years, not months. The freeze is a political posture designed to try to slow the movement of people by boats. It fails to address the root causes of the movement. The old detention centre of Curtin is also to be reopened. Curtin is very isolated, around 45km from Derby, and is about 6–7 km into the desert off the Broome to Derby road. 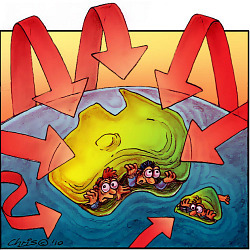 It is easier to get to than Christmas Island, but that is the only positive thing about it. Refugee Law, and humanity, require that people be treated fairly, promptly, and with respect for their dignity. These policies are not 'real action for refugees'. The Temporary Protection Visa prevented family reunion for four years or more. Asylum seekers' uncertainty about their future led to many cases of depression. Policies were put in place to make access to English classes difficult. Offshore processing in Nauru prevented a transparent process to ensure cases were determined correctly. Offshore processing is used to avoid review by onshore tribunals and the courts, and it relies on the goodwill of the Government to be done fairly. Given the current climate, independent review and transparency of processing is warranted. Previously people were left for months, sometimes years in detention. Some who were sent home found the persecution they feared. Labor started to reform its policies but has now panicked due to the boat arrivals (Abbott's 'red arrows') from the north and arbitrarily decided to freeze processing for some people. Refugees want real action. They do not want the Coalition's plan to return to the punishing policy of the Temporary Protection Visa. Nor do they want the Rudd Government's inaction on Sri Lankan and Afghan cases. The real action should be to treat people with dignity and apply the law fairly and justly. Grateful for this article right now, as yet another friend needs convincing. Where do they get this stuff about everyone going through the "right channels"? By the way, how did Abbott's family get here? What's the difference between a boat and a ship?
" The real action should be to treat people with dignity and apply the law fairly and justly." writes Kerry Murphy. Indeed! How can we settle for anything less? The mornings I head to work I pass a group of six women at a bus stop close to home. 6:30 AM: there they are, black, graceful, tall, elegant, riotously coloured head coverings & dresses to the ground,white teeth flashing; absolutely drop dead gorgeous in every respect. I see three of them regularly at the library-watching girlie stuff on the 'pooters. We make eye contact on occasion:open decent trusting human connection occurs. Each time I see these young women, my eyes well with tears & a feeling of gratitude arises in me that my taxes are in some small way going to give them a likely decent future. More positive most likely, than possible in Occupied Palestine for instance. Or in Occupied Afghanistan. Or in Occupied Iraq. Occupied by our defence forces & by our 'good friends' the USA & the Zionist State of Israeel. And also on the same Planet Earth as I inhabit we have the Good Christians- like Messrs Rudd 'n Abbott. What do you suggest Australia should do with regard to immigration, both legal and illegal. What is the answer to illegal immigration? None of these arrivals is "illegal" writes Kerry Murphy and yet two of the first questions Kerry is asked by a commentator (Trent) refer to "illegal immigration." All logic, all precise use of language, all humanity, is thrown out the window when Australian politicians do or say anything to appeal to people's ignorance, prejudices or fears to win votes. I will never know what it is like to walk down Pitt St in Sydney or Collins St in Melbourne as a coloured person. I don't know what it is like to be driven to fleeing one's own country to one that is racially, linguisticly and socially different. And I can't imagine how I'd cope if I had to flee Australia to an Asian or an African country. But I do hope if I ever did I would not be told as I stepped ashore in Vietnam or Mauritius:"You're an nice man but what you have done is illegal. So back you go and join the orderly departure queue.Good luck!" Another valuable article from ES - thanks, Kerry Murphy. But it frightens me to think what power Abbot's ignorant (or dishonest? )populism has to sideline the informed decency this article advocates. If Abbott and Rudd want a quick and easy way to prevent the non- prearranged entry of asylum-seekers, they should act to revoke our endorsement of the UN refugee convention. That at least would be an honest position to take, and the world would know where we stand. The shock-jocks would no doubt applaud loudly too. But would that make our borders any more 'protected', our country and our people any more 'secure'? Abbott espouses 'real action' (smell the testosterone?) but 'real action' in Iraq and Afghanistan, and virtual endorsement of 'real action' in Palestine, by western politicians is arguably a significant contributor to the generation of asylum-seekers. I'd think more of Abbott (and of Rudd) if they promised 'real action' to eliminate the causes of their so called problem, including our own complicity in those causes. Tony Abbott is correct; the majority of criminal people smuggler gangs are based in Indonesia. In all fairness, the Government of Indonesia tries hard to stop these gangs. In Australia, we have a whole industry benefiting from these criminal gangs. This industry hides behind a fog of “Human Rights” and exploit the basic good in most people. The Rudd Government had given the green light to people smuggler gangs and it will be very hard to stop the impression that Australia is a “soft touch”. The real issue remains the same. There is a proper and legal process for refugees to enter Australia. The UNHCR assists in screening and resettling of these refugees. I know of cases where genuine refugees had to wait over a decade to enter Australia. It must be very hard for these people to see how others with sufficient funds to pay off criminal people smuggler can enter Australia with ease. Why should a poor peasant from Bhutan have to wait for over a decade, whilst wealthy people from other countries can come to Australia in a couple of days using people smuggler? I don’t think this is fair! One of the great things about being a Christian is our freedom from qualms concerning the injustices inflicted on us by refugees. It is the old story of the Good Samaritan who acted like Goldsmith's Village Preacher "Whose pity gave ere charity began". Good on yer, Kerry, for questioning the xenophobia which drives policy on the run,coming from both the Abbott Opposition and Rudd Government. I want to see courageous and compassionate political action, with an end to "excision" of offshore Australian islands, and the dumping of asylum seekers out of sight, out of mind. Let's mobilize urban Australians for refugees, and emphasize Australia's understanding of the national interest as the humanitarian interest. There is hysteria about people arriving by boat. Think of the number of people arriving by air. Potential terrorists and criminals take a flight often using false passports. There is always a two way traffic. Many people especially those highly skilled migrate for better jobs overseas. Beat, there is nothing illegal about asylum seekers entering Australia by boat. No asylum-seeker has ever been charged with such an offence. There may be laws against smuggling, but there are no laws against being smuggled. So why penalise asylum-seekers who arrive by ship but not asylum-seekers that arrive by air? Why restrict the access to legal process of the former and not the latter? How can you justify laws that sanction detention by an administrative act without a court order or without the right of appeal to a court? The police can't detain someone for murder without bringing them before a magistrate but an immigration officer can detain indefinitely an asylum-seeker without a visa without any judicial oversight whatever. You ask why the the poor peasant from Bhutan has to wait ten years 'whilst wealthy people from other countries can come to Australia in a couple of days' (usually only after man months or years of wandering through other countries). But what about those who are even more wealthy and better connected and can afford to get a passport and a visitor's visa and fly in and then make a claim? Is that 'fair' to either the peasant from Bhutan or the boat-person from Iraq or Sri Lanka? If you don't believe that every person who arrives in this country by whatever means and who is adjudged against UN criteria to be a genuine asylum-seeker has a right to by granted asylum and treated like a real human being, then advocate for our withdrawal from the UN refugee convention. But until we do that, we should not differentiate between asylum-seekers on the basis of the vehicle by which they arrive. I know it's hard for most of us to accept that our paranoia about immigration is based on the colour of a person's skin Uncle Pat). Howard once got up on his hind legs and declared that Australia would welcome white Rhodesian farmers lock stock and barrel, post-war 10 Pound 'poms' were accepted into this country on the basis that they were our kith and kin and so on. White Australia was truly alive then, what we now have is a slightly beige Australian policy on migration in either Rudd or Abbott format. While we, as a Christian sovereignty, pay lip service to its fundamental belief in charity and all that goes with our national and spiritual psyche; all those are thrown aside to be replaced by our seemingly concerned about population sustainability and its effect on global climate change. The scientific reasons we trot out to support our national stance on immigration ( asylum seekers included) only hide the truth; we just don't want anybody who don't look or behave like us share the air we breath or the water we drink. For once, can we, at least, be honest with ourselves? If I were a desperate refugee, I wouldn't want to come to a country that welcomes me under pressure from other humanitarians. To paraphrase Kerry Murphy, we have yet to learn how to "treat people with dignity and apply the law fairly and justly". Until then, we're a nation of fools in a fool's paradise. When are we going to give up kidding ourselves that Tony Abbott is some sort of fair dinkum Catholic? I suggest we urge on the government and on everybody else that we build a detention centre, estimated to be adequate for 5 or 10 years, in Melbourne and stop this over-the-horizon stuff. Everyone should read up on the history of the holocaust. The proper process rave is based on the lie that resettlement of refugees from other countries is how the refugee process works. A new paper in the Parliamentary Library finally debunks that lie. The law changed in 1992 for the ignorant. Before 1992 it was an offence under the Migration Act to be here without a visa. In 1992 the refugee convention was enshrined into the migration act and the convention makes it clear that arrival is not illegal and must not be punished. I don't know what part of that is too difficult for people to get? If every country decided to be as dopey as we are and use the refugee convention as border security then the convention would be worthless but we persist in this idiot language. In 1938 we decided not to accept jews so we could protect the white Australia policy, what are we protecting now? This bloke is a dangerous reactionary Catholic... Nothing worse. And he is being used by people even madder than he is. i feel ashamed. He is a dangerous reactionary Mick - the worst sort of fanatic. he will stop at nothing to win. I prefer Tony Abbott to of the selfish groups pretending to care for refugees. If Tony Abbot is able to re-introduce fairness to the migration process and can control the criminal people smuggling industry, then he should get the support of all Australians. The problem is that we have too many people in Australia benefiting from people smuggling. The UNHCR is doing a good job, but the people smuggling industry and selfish supporters sabotage its actions. Tony Abbot is for fairness and does not want criminals to determine who is coming to Australia. Jane Ryan, Abbott's Catholicity, nor Rudd's Anglicanicity for that matter, has nothing to do with it. It's their humanity and common decency that is being questioned here. Perhaps Eureka Street could contribute to the immigration debate in a more constructive way that it is currently. At present we are being presented with a succession of diatribes railing against the policies and practices of the past and present Prime Minister and the policies of the Leader of the Opposition, followed by a litany of yeas and nays from a chorus of the usual suspects. Amongst all of this negativity I have failed to detect a single positive suggestion as to what the Government should in fact actually do. What comprehensive, feasible, concrete, practical plan of action should it implement? Yes, of course, "The real action should be to treat people with dignity and apply the law fairly and justly", but what precisely does this mean in practice, not just in theory. Where is the plan based on this as policy? Surely amongst its stable of experts ES has someone who would be prepared to outline such a real plan of action, so that then the debate would have real form and purpose, not just elegant (or mostly inelegant) posturing from both sides. 1. I don't believe that Abbott has ever claimed that we should not show compassion for those who are in genuine need of political asylum. Abbott is not attacking asylum seekers. He is attacking the government and using the need to safeguard national security as a stick in which to try to beat the government with. 2. You state: "Waiting for these countries to improve enough to respect human rights, when both have been torn by conflict for over 30 years, will take years, not months." does not therefore mean that Australia cannot seek a better solution so that people would not necessarily have to leave their own country. 3. You fail to make any mention of the need to put a stop to those who exploit peoples misery and endanger their lives in order to make huge profits out of people smuggling. There are no gangs of evil people smugglers because refugees seeking asylum are not being smuggled into Australia. Our courts state "this is clearly not people smuggling". The reality is that alone in the world we have turned seeking asylum into people smuggling even though we know it is nothing of the kind. All we are doing is jailing poor Indonesian fishermen for bringing refugees straight to the authorities. There has never once been a trace of evidence to support the lunatic notion that it is organised smuggling, simply because it is legal to cross borders without papers if you fear being killed or persecuted. What Australia is effectively saying is that seeking asylum is now illegal and getting help from any person to escape being killed is "people smuggling". Here is a website to visit to discover the truth instead of indulging in this brainwashed stupidity. And all those bleating on about "people smugglers", ask yourself this "if I was in danger would I pay someone to help me escape"? Go to sievx.com and see on the side the bar claiming "smuggling"
and then read the sentencing notes for the poor fishermen. Marilyn Shepherd tries to tell us that people smugglers are not criminals. I agree it is not the poor skippers of derelict boats who are to blame, as we cannot blame a pilot of a plane, which carries illegal migrants. People smugglers are mainly criminal gangs using the cash of people wishing to flee bad economic or political situations or criminal prosecution. These criminals are using poor fisherman just as the “fall guys” and nothing more. I think the tactical supporters of these criminals hiding behind the mask of “humanity and care”, are as much to blame. Beat, what is the crime? Refugees can't get passports so they pay for any transport they can get. Only in Australia does this deluded hysteria call it people smuggling. The notion that refugees should not pay for transport or come here is what we have done before with shocking consequences. It's pay for transport or be killed. Abbott is a mean-spirited populist, to judge by his general performance since elevation, and KevinR (on this matter) is little better. Abbott should, at least, get his head head around the legal terminology clarified by Murphy - preferably before going to Mass again.